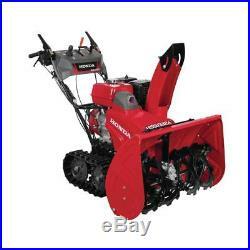 Honda HSS1332AAT 32 Hydrostatic Track Drive 2-Stage Gas Snow Blower, Red. REFURBISHED GRADE A “LIKE NEW RETAIL READY” Condition has NO cosmetic defects, blemishes, dents, scratches or signs of age. 58 x 45 x 33 in. Yup, we are confident in our refurbishment. Honda&###x27;s HSS1332AAT is the machine to satisfy your snow removal needs with the ultimate in comfort, control and convenience. It&###x27;s a product that you can trust in your time of need. It packs serious snow clearing power from its reliable, easy starting and fuel efficient Honda commercial grade GX390 engine. Additionally, with the outstanding grip provided by its rubber tracks, you&###x27;ll be able to clear snow on many different terrains. Combine this with the convenience of electric joystick chute control and Honda&###x27;s exclusive hydrostatic, infinitely variable speed transmission and you&###x27;ve got the ultimate snow clearing machine. Isn&###x27;t it time that you experience the joy of owning a Honda. Honda&###x27;s exclusive hydrostatic transmission allows you to easily match the ground speed with snow conditions, it also enables your Honda track drive snow blower to burrow through snow drifts like a bulldozer, plus, transmission disengagement is simple, making for easy transporting with the engine off. Features Honda&###x27;s pliable, low-temperature rubber tracks with sure-gripping cleats, these tracks afford superior traction through practically any snow condition, no slipping and no sliding, simply great control, even on steep driveways and steps, plus, there is no need to ever worry about flat tires or wrestling with icy and frozen tire chains. Electric joystick chute control: easily control the discharge of snow with just your fingertips, Honda&###x27;s four direction joystick controller makes it easy to put the snow exactly where you want it, better yet, it runs off of the engine&###x27;s charging coil, so no need to worry about dead batteries. Easy to control, a single lever accurately adjusts ground speed without affecting the auger rotation speed, push forward to move ahead; pull back to go in reverse, adjustments to forward and reverse speed can be made with 1 hand, quickly and easily, there are no gears, so no shifting is necessary, it&###x27;s the ultimate in control and improved safety. Hondas skid shoes are a superior design: manufactured from extremely durable materials, so they take longer to wear down, plus, they are reversible, so you get twice the life from 1 set, when 1 side is worn down, simply reverse it. Bearing supported, ice breaking serrated auger: the HSS1332AAT is equipped with an ice breaking, heavy duty, serrated auger with easily replaceable shear bolts, for durability when the going gets tough. Quick, simple and easy scraper bar height adjustment: easily adjust the aggressiveness of the scraper with Honda&###x27;s infinitely variable, thumb operated gas strut adjustment, no need for heavy lifting or funky maneuvers, simply use your thumb to adjust and you&###x27;ll be on the way to getting your work done. Powered by Honda&###x27;s legendary fuel-efficient and easy starting GX390 overhead valve, commercial grade engine, this engine features automatic decompression, so pull starting in cold weather is not only easy, but easy on the operator too, it also provides plenty of grunt to power through the toughest of snow conditions. Unit arrives assembled, oil and gas will need to be added prior to initial use, please read the owner&###x27;s manual prior to initially operating the unit. All our devices undergo a rigorous 65-point physical and technical examination to ensure that we can deliver the highest quality to our customers. As an industry leader in product sourcing and reconditioning, we are expert in providing the best and finest quality products. All our products are sourced from the USA. We grade over 10 million devices each month and only the ones that pass our rigorous quality control with a score of 100% approval are released for the retail market. VIPOUTLET was established to provide consumers the opportunity to benefit from amazing deals on: new, over-stocked, open-box, and refurbished products from the nations largest retailers and manufacturers. Retailers and manufacturers provide products directly to VIPOUTLET to leverage our extensive remarketing channels. If products arrive as open box VIPOUTLET refurbishes products to ensure they function according to the original manufacture’s specifications. Every single item we sell goes through thorough inspection processes to make sure it works perfectly. We unfortunately cannot accept payments from accounts located outside of the US and Canada. Your order will be processed by one of our 6 fulfillment warehouses as soon as we receive it. We may contact you for additional verification if needed. We proudly stand behind the quality of our products. Once the item has been received and verified, a replacement will be sent out free of charge. Nature of our Products: We sell brand new and refurbished products of a large variety – from brand new in original box to like new or Refurbished in an original or non-original box. The condition of the item you are purchasing will clearly be marked on the listing page. I received my item but it’s missing something… This means we messed up a little and we promise to make it right. I received the wrong item… This means we really messed up and we promise to make it right. Feedback Policy We understand that sometimes there are situations where you may not be satisfied with your order/product or its fulfillment. We are sure that we can provide a solution that makes you happy. Unfortunately, once you have completed checkout we are unable to make changes to your order. Visit Our Store For Best Deals. Send it back for free within 30 Days. We’ve got it all covered. The item “Honda HSS1332AAT 32 Hydrostatic Track Drive 2-Stage Gas Snow Blower, Red” is in sale since Thursday, August 23, 2018. This item is in the category “Home & Garden\Yard, Garden & Outdoor Living\Outdoor Power Equipment\Snow Blowers”. The seller is “vipoutlet” and is located in Rogers, Arkansas. This item can be shipped to United States. Tagged with 2-stage, blower, drive, honda, hss1332aat, hydrostatic, snow, track.